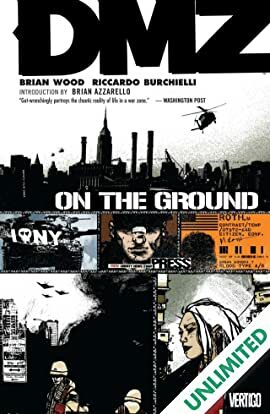 From indie comics icon Brian Wood (Demo, Channel Zero, GLOBAL FREQUENCY) and up-and-coming Italian artist Riccardo Burchielli (John Doe) comes the first volume of DMZ, collecting the first 5 issues of the series about the ultimate embedded war journalist trapped in a most unlikely war zone: the streets of New York City.In the near future, America's worst nightmare has come true. With military adventurism overseas bogging down the Army and National Guard, the U.S. government mistakenly neglects the very real threat of anti-establishment militias scattered across the 50 states. 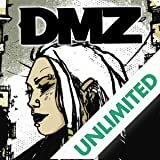 Like a sleeping giant, Middle America rises up and violently pushes its way to the shining seas, coming to a standstill at the line in the sand - Manhattan or, as the world now knows it, the DMZ.Matty Roth, a naïve young man and aspiring photojournalist, lands a dream gig following a veteran war journalist into the heart of the DMZ. 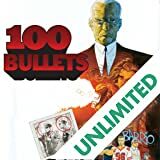 Things soon go terribly wrong, and Matty finds himself lost and alone in a world he's only seen on television. There, he is faced with a choice: try to find a way off the island, or make his career with an assignment most journalists would kill for. But can he survive in a war zone long enough to report the truth?"